The Mondaine Classic Day Date Automatic Watch features the SWISS Sellita Calibre SW200 movement, a 26 jewel self-winding watch that is famous for being both tough and accurate. It is among the finest automatic movements ever made. The Mondaine Day Date features an Exhibition Back, Leather Strap and an easy-to-read date and day of the week display. The world famous Mondaine "Swiss Railways" design is an important part of the Retro Automatic styling. It's easy-to-read and has won numerous art design awards. The design immediately identifies the watch as a Mondaine. Model A132.30359.16SBB has a white dial with black markers and hands and the distinctive red second hand. 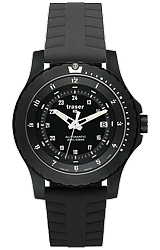 The design is completed with a matchng black leather strap. 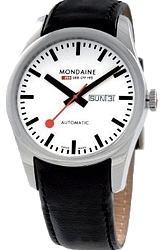 Mondaine is one of the most famous and well respected Swiss Watch brands in the world. Completely SWISS MADE of the finest materials and most accurate jeweled Swiss movements, Mondaine represents the finest in Swiss Watchmaking..
TopFlight Watches is proud to be an AUTHORIZED Mondaine Official Swiss Railroad Watches Dealer. Every Mondaine Watch you purchase from us is brand new, first quality, in the box, with all manufacturer's instructions and warranty booklets. Only AUTHORIZED DEALERS can offer the Mondaine 2 Year Limited Warranty. 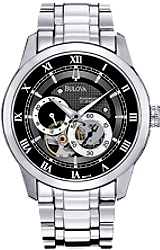 You can be assured that a watch of this exceptional quality will offer generations of flawless service. Warranty service is available worldwide. We offer the very finest personal service before, during and after the sale. We are professional jewelers, goldsmiths and watchmakers for four generations. We can handle any aspect of service you desire, including assisting you with the authorized repair of your Mondaine Watch.